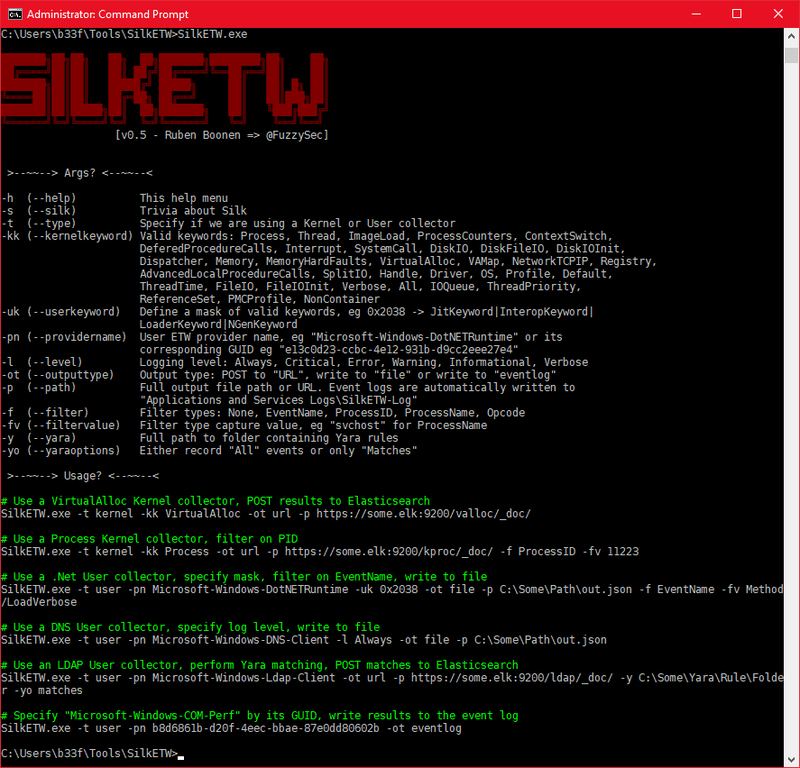 SilkETW is a flexible C# wrapper for ETW, it is meant to abstract away the complexities of ETW and give people a simple interface to perform research and introspection. While SilkETW has obvious defensive (and offensive) applications it is primarily a research tool in it's current state. For easy consumption, output data is serialized to JSON. 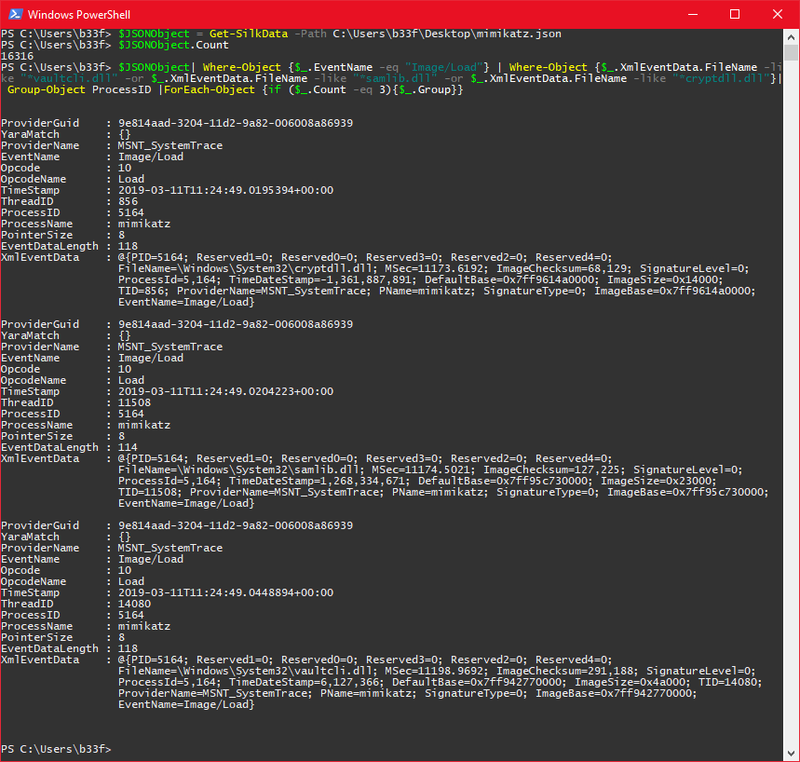 The JSON data can either be analyzed locally using PowerShell or shipped off to 3rd party infrastructure such as Elasticsearch. 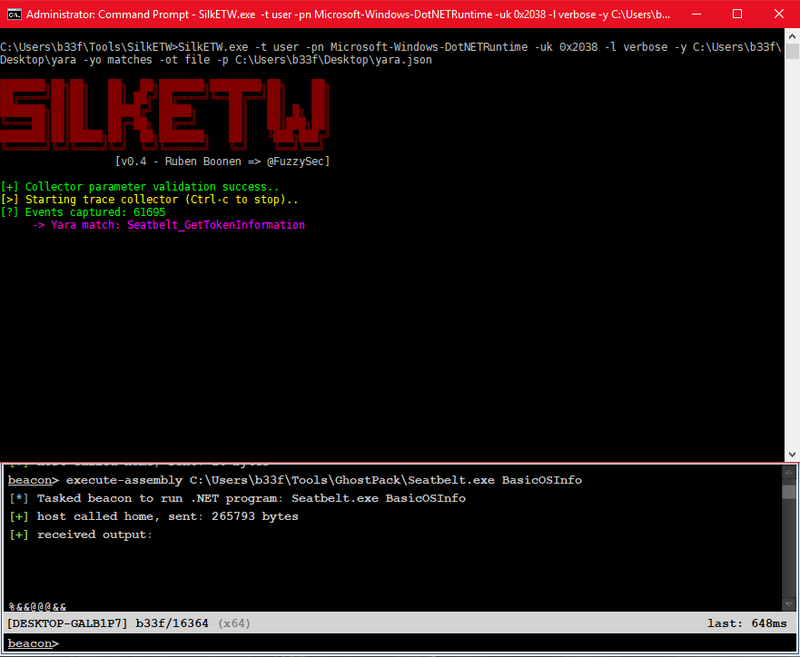 SilkETW is buit on .Net v4.5 and uses a number of 3rd party libraries, as shown below. Please see LICENSE-3RD-PARTY for further details. Command line usage is fairly straight forward and user input is validated in the execution prologue. See the image below for further details. The JSON output, prior to serialization, is formatted according to the following C# struct. Note that, depending on the provider and the event type, you will have variable data in the XmlEventData hash table. Sample JSON output can be seen below for "Microsoft-Windows-Kernel-Process" -> "ThreadStop/Stop". You can import JSON output from SilkETW in PowerShell using the following simple function. In the example below we will collect process event data from the Kernel provider and use image loads to identify Mimikatz execution. We can collect the required data with the following command. With data in hand it is easy to sort, grep and filter for the properties we are interested in. SilkETW includes Yara functionality to filter or tag event data. Again, this has obvious defensive capabilities but it can just as easily be used to augment your ETW research. In this example we will use the following Yara rule to detect Seatbelt execution in memory through Cobalt Strike's execute-assembly. We can start collecting .Net ETW data with the following command. The "-yo" option here indicates that we should only write Yara matches to disk! We can see at runtime that our Yara rule was hit. Note also that we are only capturing a subset of the "Microsoft-Windows-DotNETRuntime" events (0x2038), specifically: JitKeyword, InteropKeyword, LoaderKeyword and NGenKeyword. For details on version specific changes, please refer to the Changelog.